Auto Repair / Tune Up | Westside Transmission & Automotive Inc.
Getting your oil changed helps to reduce harmful emissions to the environment. Fresh oil is much less likely to burn and cause noxious fumes to be emitted into the air. If you own an older vehicle, getting the oil changed before visiting the emissions and registration office can be important in order to successfully pass the test. Most common causes of engine breakdown and failure revolve around the improper lubrication of internal parts. By obtaining frequent oil changes you can significantly extend the life of your engine. Most mechanics will tell you that your oil needs to be changed every 3000 miles, however with today's more advanced technology getting a change every 5000 miles in most cases will suffice. Many top mechanics rate the tune up just below the oil change in terms of importance. A tune up that is performed properly will help maintain your vehicle’s performance, gas mileage and emissions. Fortunately, tune ups are less frequent than oil changes. and we perform them all. 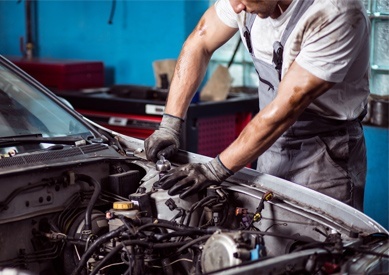 Our team will carefully and thoroughly inspect your vehicle, using factory-level technology and tools. If a problem does arise, we will discuss it with you, deciding on a course of action based on your budget and safety. If your vehicle is in need of any general maintenance and repair, come to Westside Transmission & Automotive Inc. Your home for West LA auto repair!